The rescue mission that captured hearts around the world over the course of the last two weeks might be over, but cartoons of hope and support are still flooding the internet. 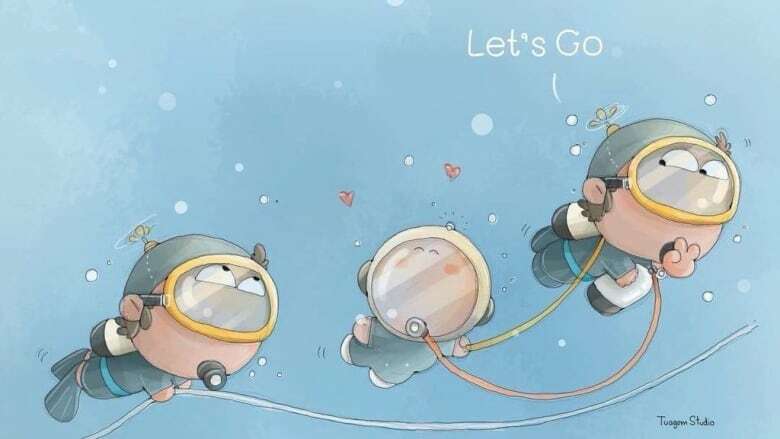 The rescue mission that captured hearts around the world over the last two weeks might be over, but cartoons of hope and support are still flooding the internet. When 12 boys and their 25-year-old coach became trapped in the Tham Luang cave in Chiang Rai, Thailand, a rescue mission involving over 1,000 people began. CBC News spoke to some of the cartoonists and artists who created these pieces. 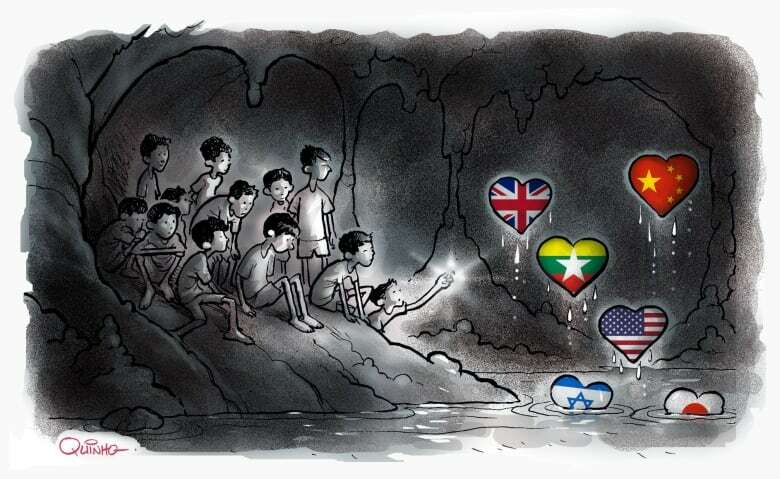 Aruni Aunhawarakorn and Jantima Manasviyoungkul shared their cartoon on their Facebook page, Sisidea, Sunday night, once the rescue was complete. Several days later, the photo has generated hundreds of thousands of shares and reshares. In an interview, the two sisters, who hail from Bangkok, said they were inspired by the "tons of kindness flowing from many countries and specialists' teams." The graphic depicts 13 wild boars, each symbolizing the stranded members of the Wild Boars soccer team, swimming out of the Tham Luang cave alongside a plethora of other animals, which represent the countries involved in the rescue and a little Iron Man, who represents Tesla CEO Elon Musk. (Aruni Aunhawarakorn and Jantima Manasviyoungkul/Sisidea, Sandy Peppler/CBC)A Canadian contribution came from Bruce MacKinnon of the Chronicle Herald in Halifax. MacKinnon has been a cartoonist for the Chronicle Herald since 1985, drawing weekly cartoons, and joined the newspaper as an editorial cartoonist full-time in 1986. In an interview, MacKinnon said the idea came to him when he noticed that he and his wife were constantly checking up on the status of the boys, despite the mission taking place during the World Cup. 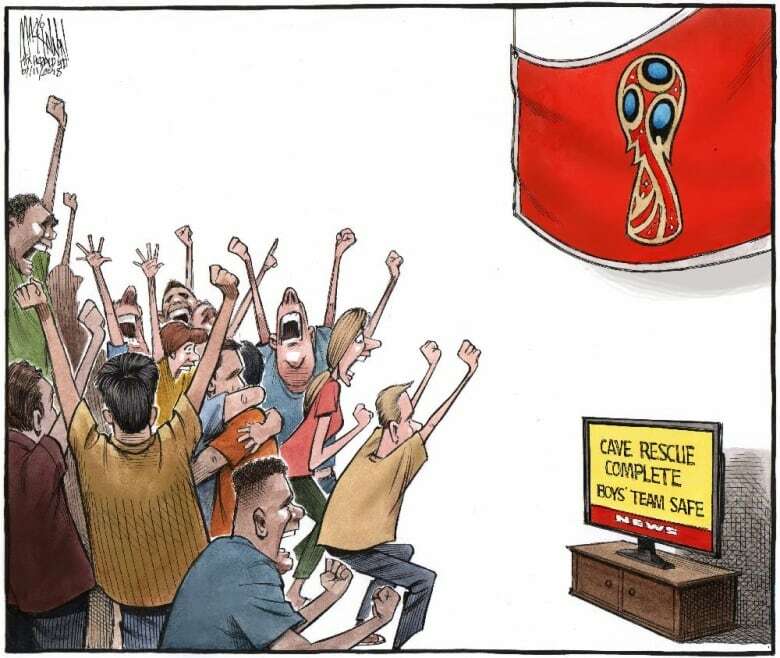 "Everyone was kind of on the edges of their seats the whole time, including us," said MacKinnon of his cartoon, which took around five hours to create. "I just wanted to bring it back home that this is what we really should be celebrating." 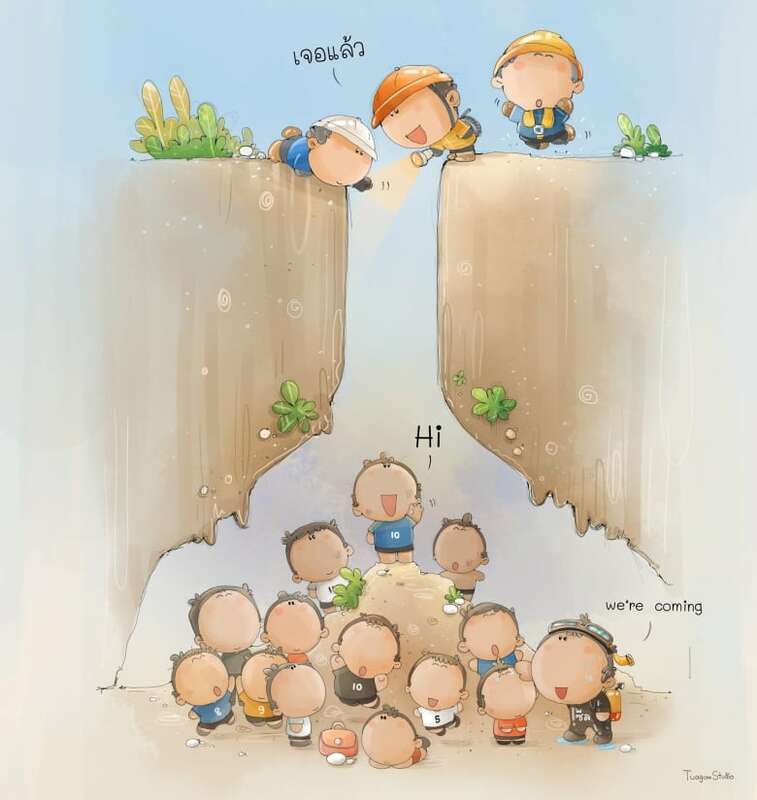 The work of Pazut Wutigornsombatkul, who draws under the name TuagomStudio, went viral on June 27 after he began drawing cartoons of the rescue mission. The Bangkok native's artist pseudonym, Tuagom, translates as a very circular, big-headed boy, reflected in his cartoons. "It's a cute style," said Wutigornsombatkul. "I want to make people smile and happy when they saw my cartoon." 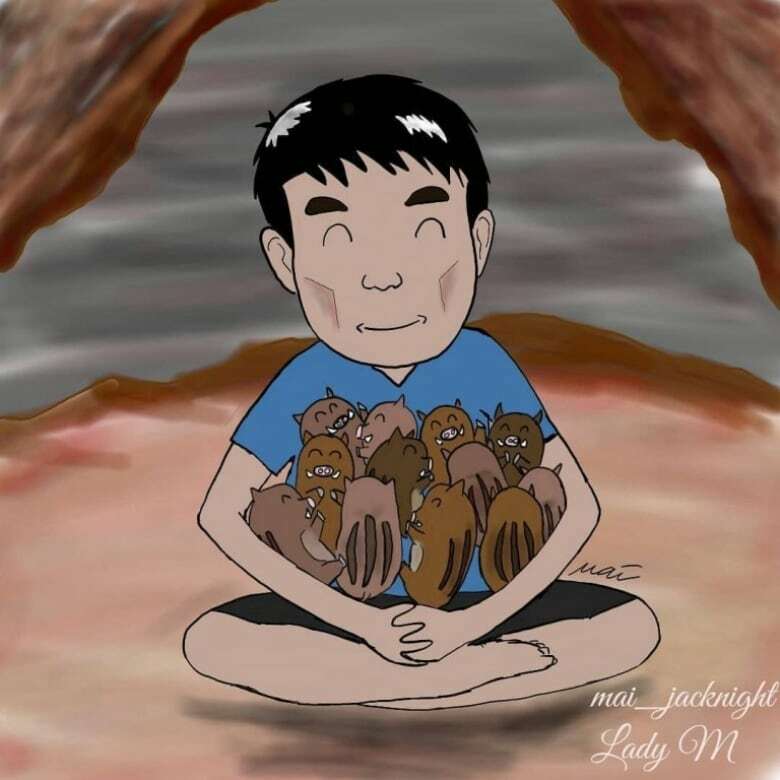 After seeing the news on social media, Wutigornsombatkul said he began drawing to help calm viewers across the globe and show his gratitude to all those who participated in the boys' rescue. Wutigornsombatkul said the feedback and support for his illustrations, which each took somewhere between two and three hours to make, were "the best things" he could have received. Here is another piece in his signature style. Emerald Bensadoun is a Toronto-based journalist interning with the CBC's The National. Emerald has worked with The Hollywood Reporter and The Huffington Post.